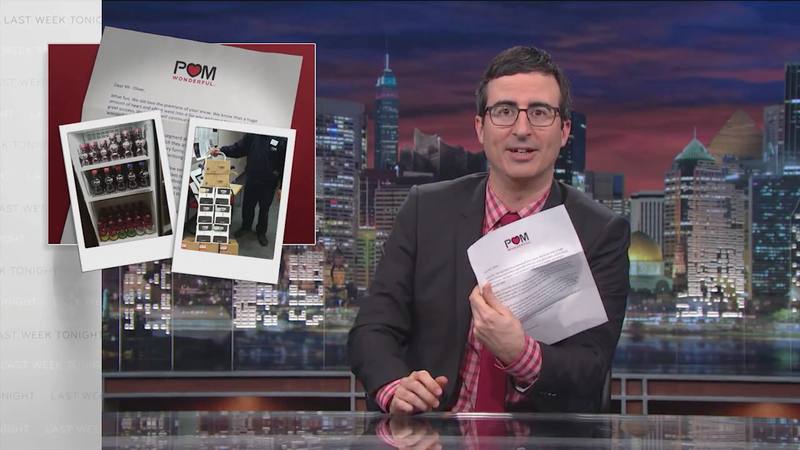 John Oliver clearly wasn't out to make marketing friends when his show Last Week Tonight debuted on HBO last month. In addition to bashing the Cover Oregon ads by Portland agency North, Oliver also dismissed Pom Wonderful as snake oil and suggested putting stickers on Pom's juice bottles saying it contains dogs. While North replied with a vehemently defensive blog post, the pomegranate juice maker took a different route. On Sunday night's episode, Oliver read a lengthy letter from Pom, which also sent the host a refrigerator and several cases of the drink. The strangely stilted letter ("We like to think we're able to take a joke. It was very funny. We laughed hard") definitely accomplished its goal, getting Oliver to give the brand a bit of a fairer shake (though not quite a free pass). If nothing else, it's good to know Pom hasn't totally dismissed the idea of a pomegranate enema.